A feisty breed of academics responds to crises, investigates disasters, and speaks truth to power through engineering. And now here was Lee-Anne Walters, 34, a stay-at-home mother of four, on the phone with a horror story. The water coming out of her taps looked like iced tea. The entire family’s hair was thinning, and her eyelashes had fallen off. The kids developed rashes every time they bathed—“you could actually see a water line afterwards with rash marks below and none above”—and one son was so sick the doctors thought he had cancer. Local and state authorities at the Michigan Department of Environmental Quality (MDEQ) denied there was any problem, and when testing finally showed elevated levels of lead, they blamed it on her plumbing. “They came up with the genius idea that they would shut my water off and hook me up by hose to a neighbor’s water supply,” she recalls with a grim laugh. Walters had learned about Edwards through Miguel Del Toral, a Chicago-based EPA water-quality assurance engineer whom she called to complain about the contaminated tap water. Over the phone, Edwards instructed Walters how to do her own extensive, 30-bottle sampling, including flushing stagnant water from the lines in advance. Edwards soon recognized the danger could not be confined to a single household. “It was going to be us or nobody to help these people,” he recalls thinking. He went on to launch the Flint Water Study, enlisting Walters and other Flint residents to collect more samples. Four months later, the study revealed the culprit: lead that leached from aging lines after the city switched utilities and began tapping the corrosive Flint River in a 2014 cost-saving measure. By year’s end, Flint had become a symbol to the nation of callous disregard for the health of poor communities. Michigan’s governor apologized, national politicians demanded action, and Congress took up legislation to correct water contamination not just in Flint, but in towns across America. Like Edwards, other engineering academics doggedly pursue probes and campaigns that pull them into the spotlight, as exemplified in six stories accompanying this article. 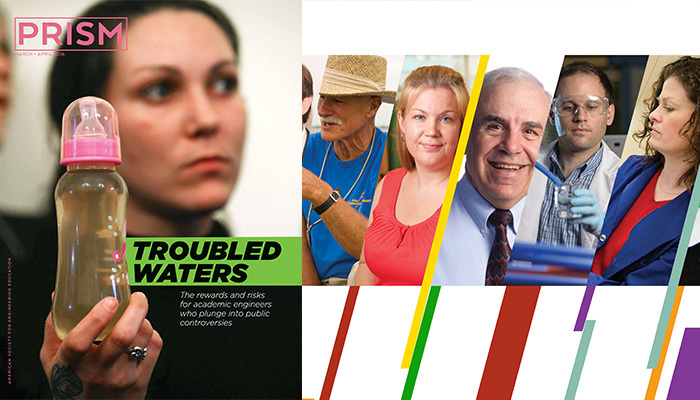 Call them heroes or troublemakers, they step out of their conventional roles as teachers and researchers to respond to emergencies, expose public health threats, investigate what they perceive as wrongdoing, uncover the root causes of catastrophes, or influence policymakers. What they share is a sense of mission—a belief that in some instances, only engineers can provide the answers society deserves. Often, these crusaders face powerful and wealthy vested interests. Robert Bea, professor emeritus of civil and environmental engineering at the University of California–Berkeley, has come up against Big Oil, NASA, and the U.S. Army Corps of Engineers in the course of hundreds of forensic studies of disasters. Heather Stapleton, a Duke University environmental engineer, has weighed in against chemical lobbyists promoting the widespread use of potentially toxic flame retardants, while Cornell University engineering professor emeritus Tony Ingraffea is taking on the oil and gas industry that sponsored much of his research by speaking out about the environmental risks of fracking. Wieslaw Binienda, chair of the University of Akron’s civil engineering department, challenged official Russian and Polish accounts of a 2010 plane crash that killed Poland’s president and other top leaders. The engineers’ weapons are their expertise, integrity, and occasionally, the prestige of the National Science Foundation, which has dispensed small grants to fund independent researchers while other agencies stood by or even worked against them. The public arena can be an uncomfortable place. Robert Bea drew ridicule from government lawyers and saw his evidence picked apart by a federal judge when he testified in a suit brought by victims of Hurricane Katrina. Binienda has been lumped together in the press with a new nationalist government in Poland seen as promoting anti-Russian conspiracy theories, and Ingraffea continues to spar with fellow academics who have attempted to refute his research findings. The April 28 water samples Walters shipped via FedEx to Edwards’s lab in Blacksburg, Va., provided pivotal evidence of dangerous lead contamination. A neurotoxin that kills cells and impairs dopamine transmission, lead is especially damaging to developing brains. It has been known to cause lower IQ, higher rates of attention deficit hyperactivity disorder, and delinquent behavior in children. In adults, it has been linked to hypertension, kidney failure, and higher rates of miscarriage. The EPA action level for lead in the water is 15 parts per billion (ppb); the World Health Organization recommends 10 ppb. The average sample from the Walters home contained 2,000 ppb and one tested at an alarming 13,200 ppb—almost three times the lead level that EPA deems toxic waste. The results were so flabbergasting that Edwards and his team retested samples with extra quality assurance and control checks. The lead levels didn’t budge. As was the case in Washington, D.C., flawed sampling methods had given Flint’s residents and officials false assurances of safety. Edwards had an ally in Del Toral, a Chicago-based EPA water-quality assurance engineer and leading expert on the rule governing the allowable amounts of lead and copper in water. “A good guy—like virtually all EPA employees,” Edwards says. Besides putting Walters in touch with Edwards, Del Toral also conducted two inspections at her home. He determined that corroded pipes must be the culprit since every piece of interior plumbing, including valves and connectors, was made of plastic certified for drinking-water use. Knowing that children were in danger, in late June Del Toral put his career on the line and sent an internal memo alerting the regional EPA’s water division chief to the crisis in Flint along with recommendations for addressing it, including reviewing the city’s corrosion control and sampling methods. When he was Carolan’s age, Edwards originally planned to enter medicine. He switched to engineering when he recognized that it, too, could address human health problems. The Buffalo, N.Y.-area native can pinpoint the precise moment his career aspirations changed. A guest lecturer in his SUNY Buffalo pre-med class described the Love Canal tragedy of the late 1970s, when 22,000 tons of toxic chemicals buried in corroding barrels seeped into basements and polluted the air, burning children and causing birth defects. Environmental engineers were going to fix the problem, the visitor predicted. “When I heard that, it sounded like an altruistic profession where you could help even more people than in the one-on-one situation in medicine,” recalls Edwards, who “dropped everything” and, despite never having taken an engineering class, applied to graduate school at the University of Washington. In 1988, he earned a master’s in environmental engineering followed by a Ph.D. three years later. Edwards worked as a consultant on corrosion problems with water authorities on every continent except Antartica before joining Virginia Tech’s department of civil and environmental engineering in 1997. He has received six outstanding publication awards from peer-reviewed journals and a Presidential Faculty Fellowship awarded by the White House. He used up all $500,000 from his 2007 MacArthur Fellowship challenging the Centers for Disease Control and Prevention, which issued a report in in 2004 minimizing the effects of lead on children in the nation’s capital and disputed Edwards’s concerns in press releases. It wasn’t until 2010 that a congressional report concluded the CDC’s evidence was “scientifically indefensible” and based on flawed data and faulty assumptions. Events moved swiftly. The following month, the MDEQ director publicly acknowledged his agency had made a mistake. (He resigned in December.) In January, Governor Rick Snyder asked for help from the Federal Emergency Management Agency and activated the National Guard to distribute water and water filters to Flint residents. President Barack Obama signed an emergency declaration to provide federal assistance, saying “If I was a parent up there, I would be beside myself that my kids’ health could be at risk.” Snyder appointed Edwards to participate in the newly created “Flint Water Interagency Coordinating Committee,” with a mandate to come up with a long-term strategy to address the water crisis. The 17-person team was given three years to report their recommendations. Meanwhile, health authorities are struggling to ascertain the damage to residents. Early this year, the United Way of Genesee County estimated that as many as 12,000 children had been exposed to lead and started a campaign to raise $100 million for their medical treatment. Politicians also seek to address Flint’s plight, touching off a partisan tussle that saw both Democratic presidential candidates visit and debate there. A proposal by Michigan senators Debbie Stabenow and Gary Peters, also Democrats, to provide $600 million to replace corroded pipes and manage the aftermath was dubbed an impermissible “earmark” by the Republican majority whip. In late February, however, the pair worked out a deal with the chair of the Environment and Public Works Committee and a bipartisan group of senators that includes $170 million in subsidies, loans, and grants to help cities replace aging water infrastructure and states cope with water emergencies. Recent weeks have brought a glimmer of hope. Declaring the local and state response “inadequate,” EPA took over sampling and analysis of Flint’s water, which once again flows from Detroit and Lake Huron. The city began replacing residential lead service lines, and Virginia Tech just launched a second round of testing on the 271 homes that had the highest lead readings in August and September. Interim assays show that lead levels, while still unsafe, have dropped dramatically—all because “this collection of outsiders got kids out of harm’s way,” as Edwards told a C-SPAN interviewer. Despite having to fight to be heard, Edwards says the Flint fiasco “has largely restored my faith in politicians.” Regardless of their party, elected officials “were reaching out to the scientists and engineers who were paid to do this job.” Unfortunately, he adds, all were “lied to in an attempt to cover up wrongdoing by career civil servants.” It’s happened before. In the Washington, D.C., lead case, “five heroic whistleblowers” lost their jobs and reputations “for doing the right thing,” he recalls, while “not one” person in the water utility or federal agencies involved was held accountable. The question of who watches the watchmen (quis custodiet ipsos custodies) dates from ancient Rome, when, coincidentally, cuisine ran to lead-seasoned food and tainted wine. By assisting residents in collecting and publishing water-quality data, the Virginia Tech team may finally have supplied the answer—and possibly opened a new chapter in engineering education history. A forensic engineer faces a powerful adversary. A key member of Berkeley’s Independent Levee Investigation Team, led by Raymond Seed, Bea helped produce a 700-page report concluding that Katrina grew from a natural disaster into a full-blown catastrophe “principally due to the massive and repeated failure of the regional flood protection system.” The report found that a series of earthen levees intended to protect New Orleans were poorly designed and built. They were not armored—shored up with rocks—they were too short, and made of too much sand. While the report held no one group or organization responsible, investigators “uncovered a persistent failure to learn; to adapt to technical advances, and even to heed the results of the U.S. Army Corps of Engineers’ own research” by its New Orleans District. Bea speaks as a onetime insider. His first job was at the Corps, following in his father’s footsteps. His work included building levees in Florida to help drain its swamps. Bea, whose hundreds of previous forensic investigations included the sinking of the Exxon Valdez in 1989, and the explosion of the space shuttle Columbia in 2003, followed Katrina with a probe of the 2010 Deepwater Horizon oil spill. A Berkeley website shows a 2011 “certificate of recognition,” signed by Sen. David Vitter (R-La.). Citing both Katrina and Horizon, it thanks Bea “for your knowledge, understanding, compassion, and tireless work.” In the Big Easy and bayous, Bob Bea remains a hero. A civil engineer and rock specialist duels with champions of cheap energy, one town hall at a time. When he chose rock-fracture mechanics as his dissertation topic at the University of Colorado–Boulder in 1974, Tony Ingraffea never imagined the obscure field would vault him into the public spotlight as an environmental evangelist. But the 18 years he spent investigating well drilling and high-pressure gas transmission pipelines – starting with a 1983 sabbatical at Lawrence Livermore National Laboratory studying eastern Devonian shale – gave him the foundation to become an early expert in the extraction technique called hydraulic fracturing, or fracking. Fast forward to 2009. Record prices for natural gas had made tapping the Marcellus Shale economically viable and touched off a rush to lease land in upstate New York and Pennsylvania. Reeling from the Great Recession, farmers leaped at $1,000-plus per acre deals for drilling rights. Ingraffea, who by then had earned distinction as a professor of civil and environmental engineering at Cornell University, was driving with three fishing buddies when one asked what the heck “this fracking stuff” was. “I know a little something about it,” Ingraffea replied. But the question made him want to know more. So he decided to “see what the industry was up to,” particularly the drilling method’s potential effects on human health and the environment. Ingraffea scoured the literature and found almost nothing relating to health risks or water and air quality – issues communities were starting to worry about. His fishing club and other local groups invited him to speak. One talk led to another, until Ingraffea became something of a circuit rider, laying out the science and engineering facts with videos and graphics at community meetings and colleges around central New York and Pennsylvania, his home state, where well water suddenly would turn from pure to putrid. He’s a founding board member of Physicians, Scientists, and Engineers for Healthy Energy. In the spring of 2011, Ingraffea and Cornell colleagues Robert Howarth, a professor of ecology and evolutionary biology, and Renee Santoro published a bombshell: the first peer-reviewed paper on methane emissions resulting from fracturing of shale. Though natural gas is touted as cleaner than liquid petroleum, methane has far more potent greenhouse effects than carbon dioxide, so even small leaks can have a big impact. Their study estimated that as much as 8 percent of the methane from a shale gas well escapes into the air unburned—up to double the release from conventional production—in part because the fracking process in shale is more intense and requires more venting. The findings helped gird New York’s anti-fracking movement, landing Ingraffea and Howarth among Time magzine’s 2011 “People Who Mattered” along with movie star Mark Ruffalo, a movement activist. Critics started attending Ingraffea’s community lectures. Some fellow academics sought to refute his research, among them Penn State geoscientist Terry Engelder, known as the father of Pennsylvania shale gas. While Ingraffea never experienced any attempt by Cornell to muzzle him, he came to realize that he’d touched the third rail of U.S. energy policy: the view that plentiful natural gas was vital to prosperity. What kept Ingraffea going? “It was personal,” he explains. “We weren’t talking about the abstract or stresses on a bridge… but people who are feeling it, really worried about drinking water, the value of their homes, their kids’ health, and climate change.” His community visits also had a big impact on his teaching. “Let me tell you where I was last night,” he might begin a class, and describe a community’s likes and fears to underscore the social context of what his students were learning. Reports by the National Academies and others have built on the Cornell study’s base, identifying risks from well-water pollution to earthquakes. Dozens of jurisdictions and even some states, including New York and Maryland, have banned shale gas development. That doesn’t mean the dangers have dissipated, says Ingraffea, who retired in 2014 and continues to teach, speak to community groups, and provide expert testimony—including in the Dimock, Pa., water-contamination suit that ended in a $4.2 million verdict against the shale gas driller. Events such as the recent “methane disaster” caused by a ruptured well casing in Southern California give him a reason to keep speaking out for some time to come. An expert on fracture mechanics and aviation uses simulations to challenge official explanations of a controversial Russian air disaster. Wieslaw Binienda left Poland in 1982 after spending three days in detention when the Soviet-backed regime imposed martial law. Three decades later, he is again at odds with Moscow—this time faulting official accounts of the 2010 plane crash in Smolensk, Russia, that killed Poland’s president, Lech Kaczynski, and other senior leaders. Binienda, chair of the University of Akron’s civil engineering department since 2003, specializes in how a crash or projectile damages aluminum and other aircraft materials. His main questions about the Smolensk disaster focus on a birch tree that Russian investigators say was clipped by a wing during landing, sending the Tupolev TU-154M out of control. How was it possible, Binienda wondered, for a jet’s wing to cut through 15 steel columns of the World Trade Center on September 11, 2001, and yet be shattered by birch branches? Binienda’s graduate students conducted simulations based on methods used to explain damage to the space shuttle Columbia, concluding there was no way a tree could cause such damage. “A birch tree is 100 times weaker than aluminum,” says Binienda, who adjusted the model to make the tree four times stronger, but got the same result. “All my work and the work of many other experts show that the airplane disintegrated in the air,” says Binienda. “Only explosions can be responsible for this kind of destruction.” A Russian investigation ruled out that scenario, as did two conducted by the post-Kaczynski Polish government. They instead blamed a combination of dense fog, poorly trained pilots, and errors by Russian air traffic controllers, according to press accounts. Russia has yet to return the wreckage or black boxes to Poland. Binienda has agreed to join a new investigation launched after Kaczynski’s Law and Justice Party returned to power last year. “There are hundreds of professors and experts analyzing this crash from various points of view,” he says, including Frank Taylor, a member of the team that investigated the 1988 bombing of Flight 103 over Lockerbie, Scotland. Binienda’s own credentials include editorship of the Journal of Aerospace Engineering, work with NASA and the Federal Aviation Administration, numerous publications, and an appreciative mention in a 2014 White House report on advanced manufacturing. While he has full support from his university, where research on the crash has provided useful training to his Ph.D. students, Binienda has come under pressure “by various unknown people not to conduct this research. The threats were coming via emails, phones, articles and in other ways.” For the onetime Solidarity movement member, the struggle against suppression of the early 1980s is not easily abandoned. An environmental engineer alerts policymakers and the public to toxic flame retardants in furniture and other household goods. Flame retardant chemicals have been integrated into millions of products since 1975, often furniture and electronics. While it may seem comforting to know that a child’s mattress won’t ignite near a candle, these chemicals can have detrimental effects on those who are exposed, while doing little to protect against house fires. Depending on the chemical—and there are hundreds in use—health effects may range from cancer to neurotoxicity or endocrine obstruction, and children are particularly susceptible. And because so many of the materials are proprietary blends, it’s hard to tell what exactly is used in each product. This is where Heather Stapleton comes in. An associate professor of environmental chemistry at the Nicholas School of the Environment at Duke University, Stapleton studies how flame retardants collect in homes and build up in the body. The chemicals in these materials can leach out over time and be captured in dust throughout the home. Particularly at risk are small children and pets, because they spend a lot of time near the floor and often put inappropriate objects in their mouths. Chemical companies have long backed laws mandating flame retardants in upholstered furniture and other household goods, tapping into the public’s fear of house fires. Stapleton’s studies and testimony have alerted policymakers to the chemicals’ potential dangers. For instance, her research on two products, chlorinated Tris and Firemaster 550, helped persuade California lawmakers to amend their fire standard law, TB 117, and let furniture companies use lower amounts of flame retardants or forgo them altogether. Stapleton began soliciting home material samples from the public in 2010 for research and reporting and began her public analysis project in 2014. By now, her lab has analyzed more than 1,000 samples. Each household can send up to five marble-size foam samples for her lab to analyze. “We have the capacity to analyze 50 samples a month. We’re usually over that capacity on a monthly basis,” she says. While her reports won’t tell people how contaminated they or their homes might be—that would require biological samples like blood or urine—they provide the information people need to decide whether they want to make changes in their homes. While research about the toxicity of many of these chemicals could continue for years before conclusions can be reached about their toxicity, science has produced some answers: One formerly prevalent flame retardant, polybrominated diphenyl ethers, or PBDEs, is known to affect cognitive abilities of children who were exposed to them at high levels either in the womb or as babies. Many companies voluntarily stopped using PBDEs following studies showing that children exposed to them had memory and growth problems. Chlorinated Tris, banned years ago in children’s clothing, is still widely used in other goods despite being a known carcinogen. “It’s difficult to determine which flame retardant chemical is the better choice. Some flame retardants are considered carcinogenic while others are considered neurotoxicants. Which is worse? I don’t know. It’s very hard to evaluate,” Stapleton says. Studies on the effectiveness of flame retardants show that they might only buy a person an extra three to five seconds to escape a fire. “The other point to consider is that, by having more flame retardants in the foam, it also generates a lot more soot, smoke, and carbon monoxide when they do burn, which are fire hazards in themselves,” she says, noting that smoke inhalation and toxic fumes are the leading causes of fire-related deaths. A computer engineer sounds the alarm about sloppy programing in safety-critical embedded systems, from automobiles to thermostats. “Our accelerator is stuck,” began the panicked 911 caller. Prayers and then screams ensued as the Lexus ES350 hurtled into a busy intersection at more than 100 mph, sailed over an embankment after clipping a car, and burst into flames. The August 28, 2009, crash that killed California Highway Patrol officer Mark Saylor and his wife, daughter, and brother-in-law en route to soccer practice that Friday afternoon prompted recalls of millions of Toyota and Lexus vehicles to fix ill-fitting floor mats, sticky gas pedals, and faulty brakes. But Philip Koopman, an associate professor of electrical and computer engineering at Carnegie Mellon University, pinpointed another reason for the surge in unintended acceleration (UA) incidents: bugs caused by “spaghetti” code in the embedded electronic throttle control system. The software flaws had only been hinted at by investigators from NASA’s Engineering and Safety Center whom the Department of Transportation had called in following a spike of UA reports in 2010. As an experienced embedded systems architect and troubleshooter, however, the academic knew what to look for. “It’s not my first go-around,” says Koopman, who was an expert witness for the plaintiffs in a wrongful death lawsuit involving the sudden acceleration of a Camry while exiting an Oklahoma highway in 2007. The problems he helped uncover, including defects in the throttle fail-safes and a dangerous single point of failure in the analog-to-digital converter, helped persuade a jury to award $3 million in damages. A Justice Department investigation culminated in 2014 with a $1.2 billion fine against Toyota for concealing safety defects—the biggest penalty against an automaker in U.S. history—and spawned a case study that Koopman presents on video and at conferences around the country. “I put this little talk together because the message needs to get out that software can kill people,” he says. Before joining the Carnegie Mellon faculty in 1997, Koopman served five years of Cold War duty as a Navy submarine officer followed by a decade during which he earned a Ph.D. from Carnegie Mellon, started several companies, and worked in industry on embedded computer systems for applications as varied as elevators, jet engines, HVAC equipment, radar, and vehicle security. His university research encompasses wearable computers, software robustness, secure embedded systems, and autonomous vehicle safety. Today’s high-end car has 100 million lines of code, double the amount in the Large Hadron Collider or Facebook. Much of the code is written by mechanical, electrical, or automotive engineers who lack strong computer science backgrounds. “Knowing how to write 100 lines of code doesn’t make you a safety-critical software engineer,” scoffs Koopman. Testing, he notes, often fails to catch a 1-in-10,000-cars glitch that will show up when millions of cars crowd the roads. Koopman’s 55-slide Toyota “scare story” caused mild discomfort among Carnegie Mellon administrators, but they were supportive. “My talk is not for or against Toyota, it’s for good and against bad software,” he insists. Koopman also steers clear of mentioning proprietary software he may have encountered in his investigations, but nonetheless isn’t surprised if he sees an apparent Toyota representative in the audience. America could improve the safety of consumer products and cars, Koopman says, by adopting international software-safety standards. Most software safety research occurs in Europe, where manufacturers must meet outside certification requirements. As cloud-based apps control more and more everyday appliances, sloppy spaghetti code in a thermostat switch could potentially bring down the power grid. Koopman hopes the software engineering community won’t wait for another Toyota-style crisis to hit before changing gears. University engineers fill a public health void after a chemical spill. When a corroded storage tank spilled 10,000 gallons of chemicals into West Virgina’s Elk River in January, 2014, contaminating the water supply of 300,000 people in and around Charleston, residents were instructed to rid their plumbing systems of toxins by flushing the pipes. This turned out to be a bad idea, as Andrew Whelton soon discovered. In some households, the flushing only meant drawing more contaminated water into the home, releasing vapors that caused respiratory and digestive problems and skin rashes. The absence of “a sound scientific approach for responding to and recovering from large-scale tap water contamination” became clear after Whelton and a team of students arrived uninvited to sample the water just days after the January 9 spill. A team led by Jennifer Weidhaas, an assistant professor of civil and environmental engineering at West Virginia University, followed a parallel path, rushing to the spill site to collect water and soil samples from the river. Like Whelton’s team, they also took samples inside homes. Freedom Industries, which owned the storage tank, was using 4-Methylcyclohexane methanol (MCHM), obtained from Eastman Chemical Company, and stripped PPH, obtained from Dow Chemical Company, mixed together to clean coal. The Whelton and Weidhaas teams, which both obtained National Science Foundation RAPID grants, filled a vacuum in the local response. “We worked with a nonprofit organization, and we did testing in people’s homes because nobody was doing that from the state, local, county, or federal governments. And that’s where people were being exposed to contaminated water,” Whelton says. The bad flushing advice was based on CDC warnings about MCHM contamination in drinking water. However, the warnings did not take into account that vapors from running water in poorly ventilated rooms would also make people sick, Whelton says. By the end of February, 2014, responders had contained the tanks and emptied them of liquid. Prosecutors brought criminal cases against six top Freedom Industries officials, and two former presidents ultimately received 30-day jail sentences. Reforms at the state level included a law requiring that operators of water systems be informed about material in above-ground chemical storage tanks so those systems could better plan a response to any spills.